Sums Up The SDUSD Response to the SD County Grand Jury! Like most bullies, Cindy Marten (like her Board of Education counterpart, Marne Foster) is really a coward at heart and, as we illustrated in Part 1, is willing to lie to succeed which translates into extremely poor leadership. Marten, Foster and the million dollar Legal Team (MFL) proved this fact again with their rejection of ALL San Diego Grand Jury Recommendations that would SUBSTANTIALLY IMPROVE the existing secretive, flawed process that only protects the GUILTY within their crony inner circle. In PART 1: SDUSD SUPT. MARTEN BETRAYS DISTRICT EMPLOYEE VICTIMS OF TRUSTEE FOSTER, District Deeds pointed out the cover ups and blatant LIES that the MFL tried to pass of as the truth. 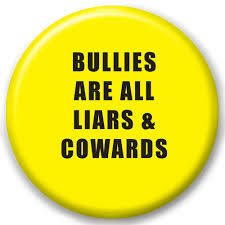 In “Part 2, BULLY SDUSD SUPT. CINDY MARTEN SHOWS HER COWARDICE HIDING BEHIND THE SAN DIEGO UNIFIED DYSFUNTION” the District Deeds Analysis will provide San Diego Stakeholders the REASONS behind the SDUSD rejection of ALL the San Diego County Grand Jury Recommendations…and what would be gained if the Board of Education rejected Marten and Foster and not the Grand Jury suggestions. Create a stand-alone Code of Conduct and Conflict of Interest Statement for Trustees. Response: This recommendation will not be implemented because it is not warranted. (Penal Code § 933.05(b)(4).) The District already has a Board Member’ Code of Conduct (GC-7) and Board Member Conflict of Interest (GC-8), as well as other governance documents which cover conduct and conflicts of interest, and clearly delineate the roles and responsibilities of the trustees and their relationship with staff. (See Board Policies GC-2; Governing Commitments; GC-3 Board Job Description, in addition to those identified above in the District’s response to Finding 1.) These documents are incorporated into the Board Governance Policy Manual, but stand on their own. OBVIOUSLY The Board Member Policies GC-2, Governing Commitments, GC-3 Board Job Description, Code of Conduct (GC-7), and Board Member Conflict of Interest (GC-8) all currently exist WITHIN the Board Governance Policy Manual. The current Board Governance manual MAY be a good ”bylaws” type document that the legal advisor for the Board of Education MAY help them interpret. But JUST AS OBVIOUS is the fact that EVEN WITH THE EXISTING MANUAL, Board Member Foster and Superintendent Marten were either NOT CAPABLE of understanding and administering what the manual DEMANDED (very doubtful) OR JUST COMPLETELY IGNORED THE MANUAL (very likely) because they felt it is vague enough to use their power to unilaterally collaborate without Board approval and allow the improper intervention into School Site Governance by Meddlin’ Marne. With a MUCH MORE DEFINITIVE stand-alone “Code of Conduct and Conflict of Interest Statement for Trustees”, THERE IS NO MORE “WIGGLE ROOM” FOR UNSCRUPULOUS SUPERINTENDENTS AND BOARD MEMBERS! Improperly gain access to SEALED documents for her son. ALL Stakeholders would CLEARLY know Meddlin’ Marne had violated the rules and DEMAND the Board take Disciplinary action up to and including REMOVAL FROM HER BOARD POSITION. ALL Stakeholders would CLEARLY know Marten had violated the rules and DEMAND the Board take Disciplinary action up to and including TERMINATION. It is EASY to see WHY MFL COMPLETELY REJECTED the San Diego County Grand Jury Recommendation…it would be SELF INCRIMINATION!!! Recommendation 15·31: Require trustees to sign a formal declaration acknowledging their understanding and acceptance of the Code of Conduct and Conflict of Interest Statement for Trustees. To their selfish advantage at the expense of SDUSD Stakeholders, MFL DISTORTS the PURPOSE and APPLICATION of this San Diego County Grand Jury Recommendation. Marten and Foster…and the rest of the Board of Education and Senior Staff HAVE NOT SIGNED ANY CONTRACT that CERTIFIES their accountability to follow SPECIFIC rules…since NOTHING in the SDUSD Board Governance Policy IS SPECIFIC! The SDUSD INSISTS that EVERY PARENT AND STUDENT SIGN A HOME/SCHOOL COMPACT with DETAILED actions and responsibilities…but the MFL has COMPLETELY REJECTED THE GRAND JURY RECOMMENDATION that they be held TO THE SAME “SIGNATURE” ACCOUNTABILITY for SPECIFIC actions and responsibilities! Not a surprise from an incompetent Superintendent and Board of Education who have refused to be held to ANY CLEARLY DEFINED PERFORMANCE ACCOUNTABILITY COMMITMENTS in the SDUSD Vision 2020, LCAP, LCFF or SPSA’s except for Graduation Rates. This is a MAJOR improvement over the loose and intentionally sloppy Governance that currently exists in the SDUSD. Recommendation 15·32: Implement a mandatory annual training program for all trustees regarding Code of Conduct,Conflict of Interest, Ethics,Roles and Responsibilities of Board Members. Response: This recommendation will not be implemented because it is not warranted. (Penal Code§ 933.05(b)(4).) The Board collectively, and Board members individually, participate in multiple trainings and workshops regarding Board Governance Immediately prior to or upon taking office, each trustee attends Orientation for New Trustees regarding Roles and Responsibilities provided by the California School Boards Association (“CSBA”). Thereafter, each trustee attends other trainings provided by CSBA, which may include ethical and appropriate behavior, human resources practices, legislative policy issues, educational policy and/or strategic leadership. A summary of the trainings attended by the District’s current trustees is attached. In addition, the Board holds a Board Workshop annually in which they conduct a self­ assessment regarding their performance in the context of the District’s Board Governance Policies,Code of Ethics and Code of Conduct. When all else fails, use a multi million dollar legal defense funded by Taxpayer dollars to overwhelm and victimize Taxpayers. By implementing this strategy, apparently the SDUSD Superintendent and Board of Education are devoid of any sense of equity, honesty and fairness and ARE RULED BY THE SDUSD LEGAL DEPARTMENT….which is why they REJECTED this Grand Jury Recommendation. Based on all the revelations uncovered in this Grand Jury Report, news items like the improper Foster Fundraisers and the Marten Cover Up of the Child Sexual Assault Report along with many, many other destructive actions By Foster, Marten and even the rest of the SDUSD Trustees, the Culture within the SDUSD has become TOXIC for ALL Stakeholders except for the top 1% Senior Management. IF the SDUSD were willing to adopt ALL the Grand Jury Recommendations, a completely NEW, TRANSPARENT training would be necessary to FULLY CONVINCE SDUSD Stakeholders that a NEW ERA of honesty, transparency and collaboration had truly begun. The current culture of fear, retribution and secrecy would soon be replaced with REAL STAKEHOLDER ENGAGEMENT. Recommendation 15-33: Implement a mandatory in-service program for school staff, administrators, and faculty to include the roles and responsibilities of staff when. interfacing with trustees or district administrators, including the appropriate conduct when a trustee or administrator is also the parent of a child who attends the school. Response: This recommendation will not be implemented because it is neither reasonable nor warranted. (Penal Code § 933.05(b)(4).) Over the years, several board members have had children attending District schools. Only rarely has there been a complaint and all have been handled appropriately without the need for District· wide training. The District has limited resources and does not agree that the benefit of providing a mandatory training for all school staff to address the few circumstances in which a trustee may have a child in the school justifies the expense of providing such training. The MFL are clearly in denial for the scope and scale of their violations AND the MUTING effect it has on ALL SDUSD EMPLOYEES…OR SIMPLY DO NOT CARE ABOUT SDUSD EMPLOYEES! ALL of the brave SDUSD Employees who TESTIFIED UNDER OATH to try to expose the abuses by Marten and Foster ARE the exception to the norm. They are the exception NOT because the improper School Site interventions by individual Board Members are rare but because INTIMIDATION AND RETRIBUTION ARE DEPLOYED TO ANY SDUSD EMPLOYEES WHO REPORT IT WHICH IN TURN REDUCES THE NUMBER OF ABUSES REPORTED! This phenomenon is eerily similar to other types of abuse in our society where abuses are under-reported because the victims are afraid of retribution by their tormentors. Historically in the Marten administration, the excuse that the “District has limited resources” only applies to Stakeholder requests like Gate, 6th Grade Camp and the enrichment programs at Balboa Park and Old Town. This time the false excuse was used to subvert School Staff Training that could backfire and actually result in MORE COMPLAINTS LIKE THIS GRAND JURY REPORT. That is the LAST THING that MFL want to happen…to be EXPOSED FOR WHAT THEY ARE! The BIGGEST benefit to implementing this Grand Jury Recommendation is that it clearly can establish the BRIGHT LINE RULE” for ALL DISTRICT EMPLOYEES AND LEADERSHIP. This rule applied to the interfacing of District Staff and Trustees or Administrators can eliminate MOST of the current confusion and ambiguity. A bright-line rule or bright-line test is a clear, simple, and objective standard which can be applied to judge a situation. In other words, it is a judicial rule that helps to resolve ambiguous issues by setting a basic standard that clarifies the ambiguity and establishes a simple response. This “bright line” would provide clarity and transparency to the RULES ALL SDUSD EMPLOYEES MUST LIVE BY…INCLUDING THOSE IN THE TOP 1%…THE BOARD MEMBERS AND THE SUPERINTENDENT. Recommendation 15·34: Establish the position of Ombudsman as part of a newly developed independent confidential process for all employees to report and resolve complaints in the district without fear of reprisals. Response: This recommendation will not be implemented because it is neither reasonable nor warranted. (Penal Code § 933.05(b)(4).) The District already has a confidential process via its Fraud Hotline for an employee to make complaints without fear of reprisal. These complaints are handled by the Office of Internal Audit which is charged with ensuring appropriate handling. The District does not believe that an additional Ombudsman is needed; nor does it believe that any benefit to be derived from creating an additional (and duplicative) process and position justifies the cost thereof. The Fraud Hotline “Confidential Process” is a District-wide JOKE that is NOT trusted by ANY tenured SDUSD Employee FOR FEAR OF REPRISAL which is EXACTLY the reason ALL the SDUSD Employees who testified for the Grand Jury and requested anonymity instead of using the JOKE “Fraud Hotline”. As long as the Ombudsman is COMPLETELY independent of the SDUSD and is certified publicly as such by the San Diego County District Attorney, SDUSD Employees could actually feel safe and secure that their honesty WILL NOT be used against them…an option SORELY NEEDED BY THE SDUSD. The Ombudsman as described would create a GUARANTEED policy of fairness and equity in decisions and directly certify the RIGHTS of ALL SDUSD Stakeholders. Recommendation 15·35: Establish an Ethics Review Panel independent of the San Diego Unified School District to monitor Board Member actions. MFL responded AGAIN with the JOKE “Fraud Hotline” that NO DISTRICT EMPLOYEE CAN TRUST. Then MFL tries to suggest the California Fair Political Practices Commission which MAY NOT CONSIDER EVERY ACTUAL VIOLATION a violation of Fair Political Practices…and by the time they respond the BOARD MEMBER IN QUESTION COULD ALREADY BE RETIRED AND THE EMPLOYEE FIRED! In addition, judging by the way the SDUSD DENIED EVERY CHARGE AND REJECTED EVERY SUGGESTION in this San Diego County Grand Jury Report, what confidence could ANY District Employee or Stakeholder have that THE SDUSD WOULD RESPECT AND RESPOND APPROPRIATELY TO A REPORT OF VIOLATION FROM ANOTHER AGENCY. Unless a WHOLE NEW PROCESS IS CREATED AND CERTIFIED, the SDUSD will continue to violate the rules they refuse to honestly enforce against themselves! This Recommendation is the ONLY WAY to effectively reign in rogue Trustees. The current Superintendent and the Board share ABSOLUTE POWER WITH NO OVERSIGHT which has, with this report, CORRUPTED THEM ABSOLUTELY. Their ability to hold each other accountable is NONEXISTENT as proven by this Grand Jury Report. Unless an “Ethics Review Panel independent of the San Diego Unified School District to monitor Board Member actions” is created immediately, the SDUSD will continue TO SPIRAL DOWN INTO AN EVEN LOWER TOXIC CULTURE and LOSE ALL THE BEST AND THE BRIGHTEST District Employees in the SDUSD BECAUSE OF IT. On behalf of the Board of Education and its staff of the San Diego Unified School District, we appreciate your concern for our District. The SDUSD Superintendent Cindy Marten and Board of Education are completely willing to wallow in the corruption and incompetence of the TOXIC SDUSD Organizational Culture because they ALL are benefitting from it…financially and professionally…at the expense of ALL SDUSD Stakeholders. Until a Board Member is indicted for a crime or crimes…until the Superintendent is exposed for allowing ANOTHER travesty EVEN WORSE THAN GREEN ELEMENTARY WHERE STUDENTS ARE SERIOUSLY DAMAGED…until the complaints from the over 200,000 SDUSD Stakeholders become UNITED ENOUGH and LOUD ENOUGH, STUDENTS WILL CONTINUE TO BE HARMED, EMPLOYEES WILL CONTINUE TO BE BULLIED, INTIMIDATED AND ABUSED, AND THE NEEDIEST OF STUDENTS WILL BE DENIED AN EDUCATION. THIS MUST STOP…and WE will do everything we can to MAKE that happen! What happened to: dream big, work hard, and be KIND Cindy MARTEN !!!!! You are a FRAUD !!!!! Great analysis Frank & District Deeds. I would add that the Teachers Union is just as responsible for this unethical and harmful behaviot as MFL. I fully support dedicated and compassionate teachers, but this Union has lost sight of the fact that our district exists to educate our children and to support our communities, not solely as a source of employment. I’m very concerned that a few teachers, who harbor discriminatory feelings are strongly influencing the Union and District. Francisca…I usually enjoy your comments both on DistrictDeeds and at the school board meetings. You are a genuine advocate for children. Without evidence to back this up, it sounds as if you have taken this from FoxNews or Rush Limbaugh, where no evidence is necessary. If your family or you have had a bad experience, it’s not fair to say teachers or their representatives are bad.